Canyoning or canyoning as one says with us, what is it actually? The word describes a novel, fascinating activity in a partial untouched and magical landscape. 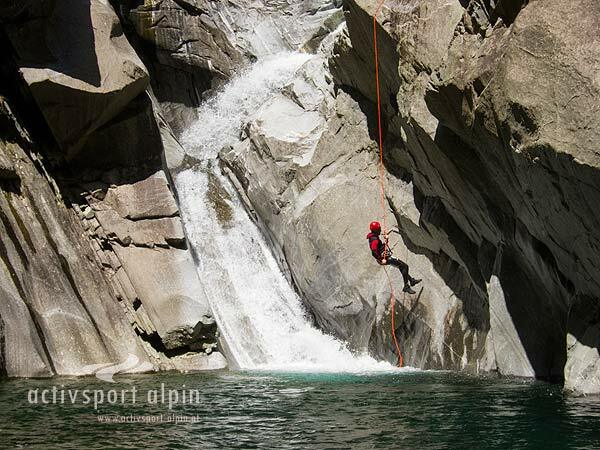 In canyoning, watercourses are descended by descents, climbing, swimming, if possible by jumping and slipping. Here the sporting variety is combined with the challenge of rock and water in a prime landscape and offers countless adventures for everyone. To experience these challenges with pleasure, there are two possibilities. First: Familiarize yourself with a certified and authorized canyoning and canyoning guide, who takes over the entire organization for the desired canyoning tour. The advantage of this possibility is that you can enjoy the tour and the nature experience to the fullest without having to worry about anything in advance. The second possibility is to train for this sport, with an expert. During these training courses one learns the most important basics to move safely through a gorge. However, if you have to take this route, you have to be very slow in new tours, because canyoning needs a lot of experience. The training for Canyoningguides is very comprehensive and covers the entire spectrum of canyoning and takes an average of up to 45 days. Here, as an example, the training route on the basis of the Tyrolean canyoning and gorge guide training. Day 1: Here the candidates have to show whether they are suitable for the training. Only then can they participate in the legally required training. When registering, the candidates must submit a tour report, should the required tours not be available, then the applicant is not allowed to participate in entrance examinations. Between the individual courses, the candidates have to pass some intermediate examinations, which allow an entry into the next course at all. 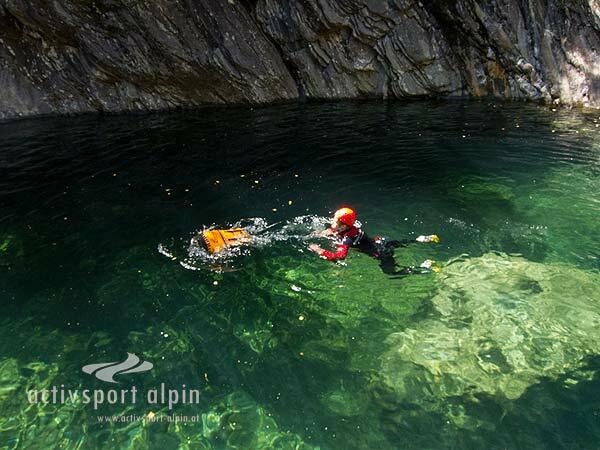 However, the candidates must also complete a 14-day practice period with a trained and authorized canyoning guide between the first and third course parts, which must be documented by an accurate record. Furthermore the candidates must bring a prescribed tour report with 10 prepared topos for the final examination. These subjects are taught practically and theoretically during the training. The theory lesson is always held by long-term trainers or guest lecturers. 2 days: Only persons who have fulfilled all theory tests, practical partial tests and requirements can be admitted to this examination. If a candidate does not fulfill the prerequisites for the final examination, he has to repeat the third course or the entire course. Only if all these criteria are met, the candidate can be authorized by the competent authorities and from this point onwards is entitled to offer and conduct canyoning tours. For this reason, every authorized canyoning guide can also identify you, so ask for your canyoning guide before the start of the tour. However, it is obligatory for every canyoning guide to undergo training at least every four years. If the canyoning guide fails to comply with this obligation, the authorization will be given to him and he is no longer entitled to lead the guests. Where can you do Canyoning? How do I become a Canyoning Guide? Is Canyoning possible by rain?